Manufacturer & Exporter of VMS Displays for Traffic. Our product range also comprises of LED Video Display, LCD Video Wall and LED Display. We offer these displays in various designs at reasonable rates. We are identified as one of a prominent manufacturer, supplier, trader and exporter of VMS Displays For Traffic. Highly experienced and trained professionals are employed by us to manufacture the offered range of displays following standards and norms of the industry. We offer this machine in different technical specifications as per the requirements of clients. 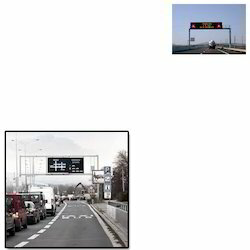 Looking for VMS Displays for Traffic ?